I forgot to attach a photo of the new connectional service to Glasgow introduced yesterday. A delightful omnibus that overnighted with us a and was moving off to Kirkby Stephen and then on to its new home in Glasgow. The first of our five day earning opportunity has passed without breaking any records but broadly equalled the revenue for last year's Good Friday representing quite a good start in these difficult times. The team managed to operate the trains service, man the Booking Offices at Wirksworth and Duffield, provide a narrow gauge opportunity, open the Model Railway and EVRA shop. The Pullman Buffet Car traded very necessary warm food with the All Day Breakfast being the most popular offer. Very many thanks to all involved. Among our passengers today were through ticket holders from Malvern and Bristol who turned out to be Branch Line Society members that needed to enjoy the Shottle loop diversion before the station reopens. 33035 was worked on to try and resolve problems with the load regulator and there was a delivery of dmu spares and refurbished parts from the Dean Forest Railway. Items for use on the lighting system above the next decking were sourced and the installation will be henceforth known as Ling's Lights. Not a bad day which turned out to be dry and cold with sunny intervals - fingers crossed for the rest of the holiday period. As many of you know conditions are not greatly improving but it remains dry as we hit the first of our five earning days tomorrow. Everything is ready and we hope that people will venture out to see the Ecclesbourne Valley in its snow covered state. The Pullman Buffet Car has been charged with providing hot fare to warm the cockles of our anticipated visitors and they will rise to the challenge. The first of our locomotive hauled set was revealed briefly as it was moved from one side of the Maintenance Facility to the other for completion next week. The photo shows the finish that is being achieved in the most unpleasant conditions. John managed to flatten and clean off the east side ready for glossing tomorrow, weather permitting. The LMSCA have devised a strategy that will enable the BSK to enter the "paint shop" immediately after the completion of the SK. It is difficult to sum up the energy being put into the project to produce three locomotive hauled vehicles within the tight timescale required but I take my hat off to all involved. The PWT recovered the RUDD from Shottle after unloading it and propelled it back to Wirksworth. They then loaded the completed "legs" ready for their eventual journey to Duffield. We have invested in improvements to the Booking Hall that will allow our products to be displayed more professionally. All the components were present that allowed Abbott enterprises to cut and fit so that we are ready for the crowds tomorrow. 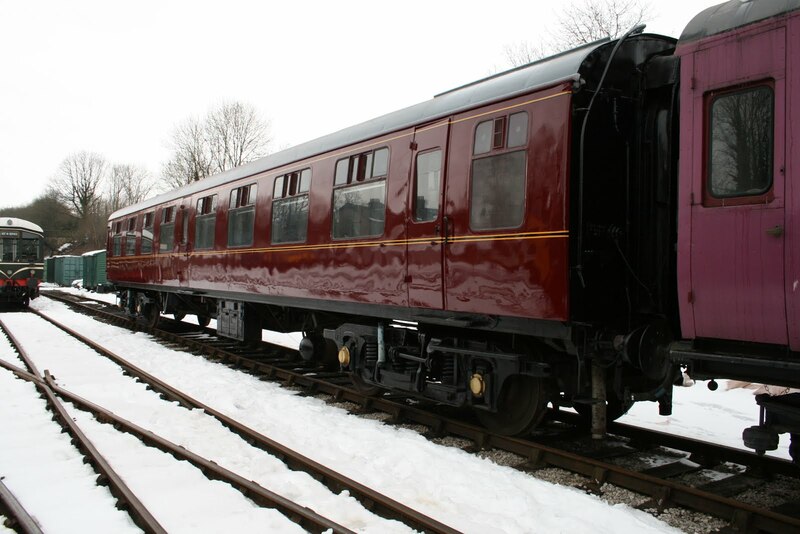 The Pullman Buffet Car pulled in some of our team and hardy walkers. 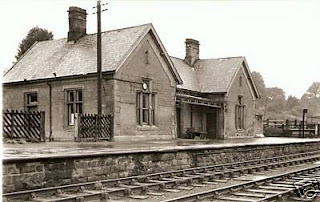 The Booking Hall, in addition to remodelling its display, continued to develop the group business. Another day of progress on the most cold of days. Yet another perfectly foul day with the LCC giving the "Bubble Car" a good do ready for her launch on Good Friday and Allsop Enterprises completed the painting of the black ends of the Mark 1 SK. 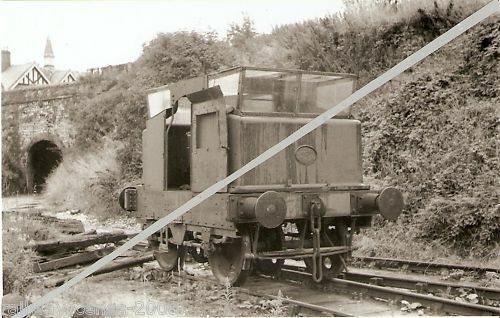 Dan continued the lining out of Henry Ellison and a further two legs were constructed for the Duffield platform extension. A photo is attached to illustrate what these "legs" are. Wirksworth site security will be affected by Charles entering hospital tomorrow for a hernia operation but the convenient arrival of Mr and Mrs Abbott form the deep south will compensate for his temporary inactivity. Both the Pullman Buffet Car and Booking Hall were in operation with limited success in the present conditions but it is pleasing to report that the first online booking for the Curry Night has been received - thank you Peter! In spite of being wreathed in the most unpleasant arctic conditions the team achieved great things today. The "Bubble Car" that with be relaunched on Good Friday had attention to its windows to remove surplus paint and two of the scrapers are revealed in the photo. The transformation of the formerly rather scruffy vehicle reflects great credit of all involved with its exterior and interior renovation. To celebrate Easter the car will operate all Ravenstor services throughout the holiday weekend. 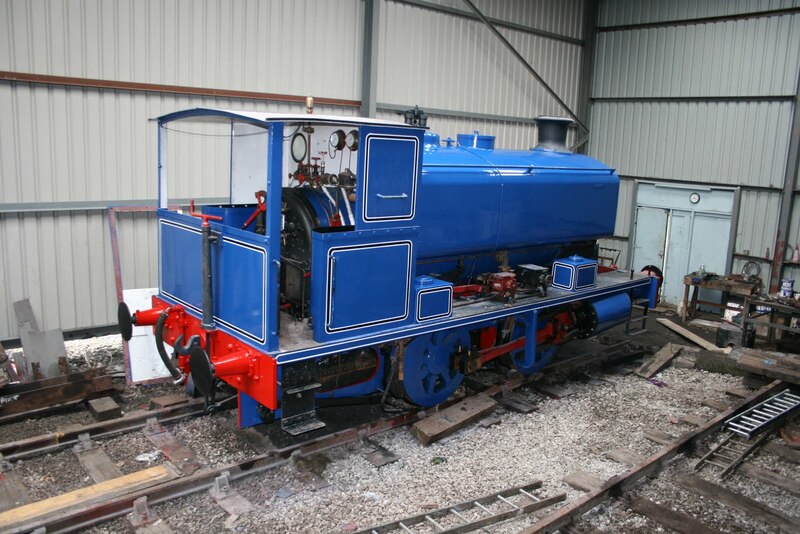 The DST ministered to their fleet and spent the afternoon in a Mutual Improvement Class in preparation for the upcoming locomotive from the South Wales valleys. The LMSCA battled on with the Mark 1 BSK and the M1M reported good progress with their CK. Unfortunately the inclement weather conditions are causing concern with these two project and additional help is needed to ensure they are both delivered in time for May. 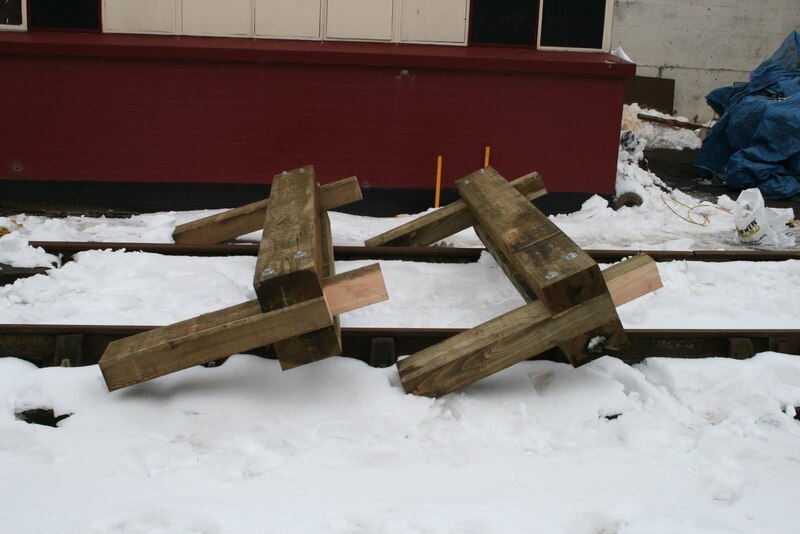 The PWT cleansed the pointwork at Wirksworth of snow which ensured we can safely move around the Yard and then turned their attention to manufacturing the supports, or legs, for the Duffield platform extension. Two of the 15 required have been achieved today which is quite remarkable in the sub-zero temperatures. Nathan, son of LCC, did a sterling job of snow clearance with Anton adding to the effort when possible and John Allsop completed the lining of the west side of our SK indicating that completion of this project is around a week away. One of LJB's starter motors was detached by Graham and Doug and delivered to a specialist auto electrical specialist in the hopes that repairs can be effected. There has been a burst of income generation activity which can be found on the web site with our first ever curry night and a new regular "pensioners lunch" available on all Wednesdays throughout the season. Our new catering team member, Martin (what a good name), is stamping his personality on this vital area of our enterprise. The Pullman Buffet Car and Booking Hall had a good and productive day with the broccoli bake going down quite well. I can also report that the Railway is taking to the air as Geoff Clark, who organises the bus rally weekend together with the classic weekend, has secured flypasts from the RAF featuring a Dakota and Hurricaine from the Battle of Britain Flight. We are researching targets that might feature for those that have inhibited our progress over the years - I can certainly think of a few! We would like to invite you to our first ever Pullman Curry Night at Wirksworth Station on Friday 19th April between 5:30 and 8:30. Choose from three curries homemade in our buffet car, with rice, naan bread and onion bahji's. Also included is a glass of beer/bitter or red/white wine (soft drink for the children). All for just £9.95 a head. Seats should be pre-booked to avoid disappointment and this can be done online from our Online Ticket Office. Bar serving beer, bitter, wines, soft and hot drinks available on the night. A day of snowmagedden in Wirksworth but we ran the service in the old fashioned way. Down the yard, Smiths Painters and Decorators carried on with lining while the wind fairly blew the nap off his brush. 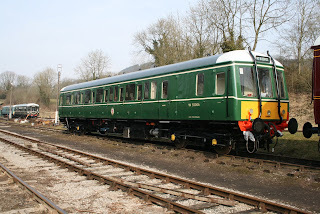 In the Class 119, the perishing DMU team fitted the cab window frames and received delivery off the refurbished corridor connection curtains from Fields of Brassington. The LMSCA, unable to enter their container due to a large snow drift were redeployed to the booking hall refurbishment project assisted by Stokes Switchgear. 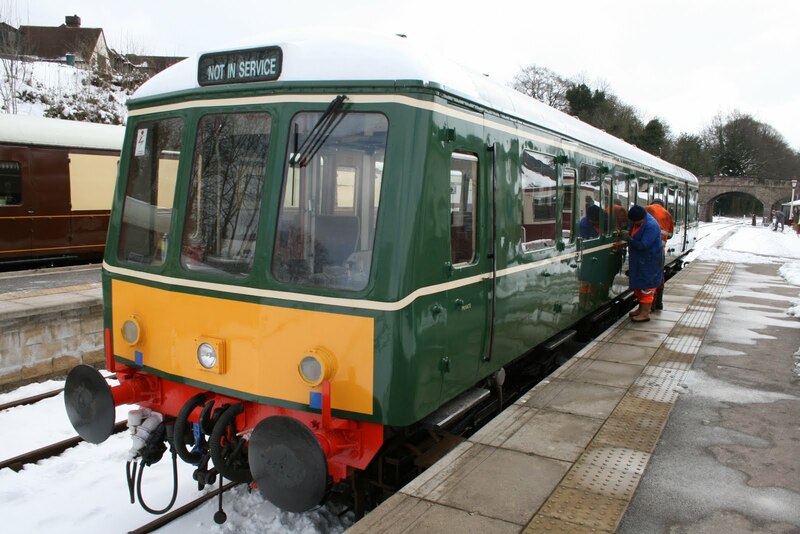 Despite the artic conditions that greeted us in Wirksworth this morning our friendly railway of the peak fielded two crews and after an early inspection of the yard and track Iris was started up and carried the first of the days passengers to Duffield where Rodney has cleared the platform for them. As the day progressed it transpired that the local buses had ceased to run so a local couple found that our railway was running and used it to visit friends in Duffield and were singing the praises of our hardy crews when they returned . 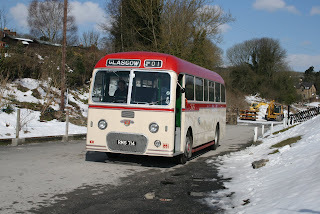 whilst back at Wirkswoth Anton and myself cleared the paths and platform of many inches of snow and enjoyed the warm food that the buffet provided and again the passengers and visitors praised the girls for the fine warm food on offer. SERVICE UPDATE: The bus still cannot get through to Wirksworth so Ecclesbourne Valley Railway train services will offer the child fare of £5.00 to anybody with a valid bus ticket for Duffield if you want to change to the train. Offer valid for today and tomorrow only. If you want to go the other way, no problem, show us your intention to buy a bus ticket and we'll honour it. Nothing has been achieved today other than the serving of two hardy visitors in the Pullman Buffet Car. However, having consulted all the oracles we will try and run a service tomorrow. To add a little something today here are a few more photos - they are small because they have been scanned from very small prints but they are nonetheless interesting. The condition of Idridgehay station is fascinating given its present value. 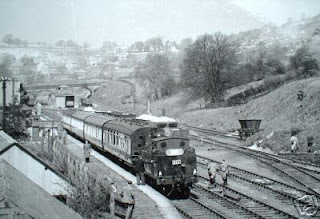 We have had some wonderful photos sent to us of our Railway in earlier day and I attach a selection for starters. Another energetic day with our test customer that concluded this week's work by loading our three Dogfish hoppers with ballast and returning the balance to the Car Park. The M1M were out in force with Rod & Mary preparing the corridor floor for renewal and other folk continuing to prepare the exterior for repainting..
Mick Thomas looked after our customer until late morning when he departed for a tooth extraction, not an enviable journey, to be followed by Tony W as they completed their day with us. Tony also spent quite some time litter picking which started with the observation of various detritus under the bridge at Derby Road 2. A bit like those people who throw MacDonald's litter out on the roadside that you hope some dreadful retribution will descend on them. The team responded to an alarm that L J Breeze had failed and it looks as though a loose battery connection caused the problem and I am very grateful for their attention to the locomotive that has a lot of planned work next week. Within the Maintenance Facility the SK gained its first pass at lining out and the Bubble Car received grey paint to guards compartment floor before being propelled under cover for treatment of the white roof ends. 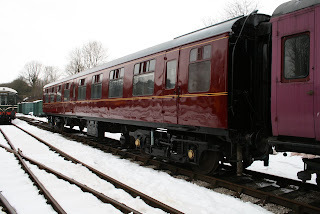 Hylton came in to warm through No3 to protect against frost damage and the Pullman Buffet car enjoyed the custom of our test customer together with the hauliers that took some of the kit away. The Booking Hall dealt with more sales opportunities and I had the difficult task of advising all our steam and diesel experience clients that tomorrow was not possible after looking at the weather forecast for our region. Thus there will be no activity at all on Friday and only time will tell if we can provide any form of service on Saturday or Sunday. This is all extremely depressing as Friday was worth over £1000 and we are very dependent on our weekend revenue. A most miserable day with snow flurries and cold rain persisting but the show must go on. An omission from yesterday's report was the interdepartmental cooperation that saw some of the DST tending to the vacuum cylinders of the Mark 1 BSK. This broadening of their horizons was noted with some pleasure and to celebrate a photo of Henry Ellison is attached revealing how it will add value to our enterprise as he enters traffic. Our test customer had a satisfactory day ably hosted by Mick Thomas and the PWT tended to some overdue maintenance in Wirksworth Yard. 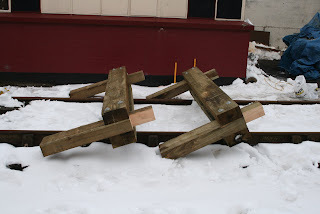 The axle boxes of our two LMS brakevans were oiled up ready for the planned journey to Duffield on Friday. The LCC tackled the Training Room, Mess Hall and Booking Hall restoring some semblance of order in these three locations. 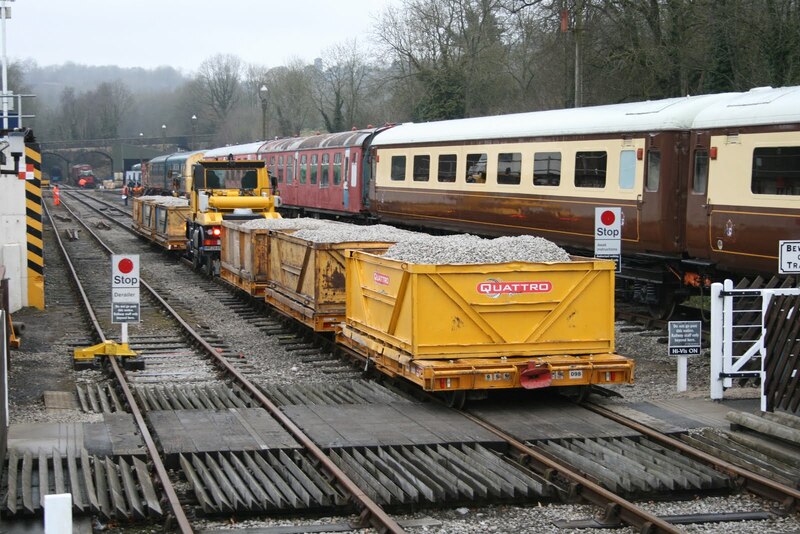 The SBT reported the conclusion of some 36ft of block course dealt with and some 80ft of backfill at the platform project using up around 3 tonnes of material representing a very considerable achievement in this quite demanding exercise. Allsop Enterprises applied the top coat to the SK on its east side and, with luck, he will commence the lining out tomorrow. The Filing Fairy maintained her enthusiasm for our administration for which we are extremely grateful. The Booking Hall processed yet more group bookings and the Pullman Buffet Car had quite a lean day due to the vile weather. 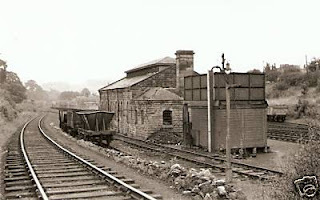 PS - Idridgehay Station and its associated land will be offered for sale in the near future with the Railway being a preferred owner. However, this will require an investment of between £600k and £700k and I would be interested in talking to anyone who could underwrite this sum. As Martin mentioned earlier this evening, we held a meeting at Wirksworth Hall called (somewhat grandly) “The Destination Wirksworth Business and Partner Event”. The purpose was to promote Destination Wirksworth to local businesses and councils by presenting the offering and describing how we could work together. I must confess that at 11:45 I thought we were going to be presenting to ourselves, but at midday we had nearly 50 people in the audience and in the space of 90 minutes we had made five presentations and even held a brief workshop on how to move forward. Two presentations stood out: Tom Tait gave a superb précis of the economic benefits of private railways on the local economy, while we were fortunate to have no less a person than David Horne, Managing Director of East Midlands Trains speak to the audience on their perspective of our little line. One fascinating detail was how the combination of an hourly service frequency and connections with our services have more than doubled passenger numbers at Duffield since 2008. Meanwhile, earlier in the day I was interviewed at Ashbourne Radio regarding Destination Wirksworth, so if you listen-in to that fine local station, be sure to tune-in on Thursday! Finally, to follow Martin’s picture from earlier, I enclose a snap for you all to see. 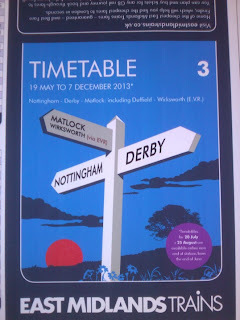 It is from a proof of May’s pocket timetable, published by EMT, for the Nottingham and Derby to Matlock train service. 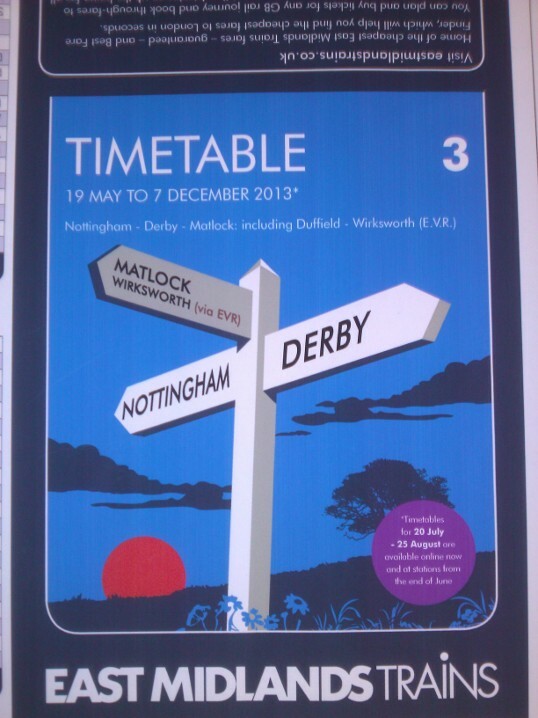 I am pleased to report that our services will be included in that timetable and the picture shows a very nice detail. Just look at the signpost! 4 Neil's Destination Wirksworth Seminar involved Iris operating three round trips to Duffield and a small sprinkle of paying guests that helped pay for the exercise. Good vibes were coming from the Town Hall and Neil will add to this missive. He is to be much congratulated for trying to integrate our enterprise with the good people of Wirksworth and illustrate a way forward that should benefit all of us. 5 The DST continued with readying Henry Ellison for his launch day, serviced No3 and worried about Cathryn that now seems to need her firebox removed. Fred and Iris were welcomed to give the Mess Hall a needed deep clean, they remain two of our unsung heroes that keep the show on the road. 6 The LMSCA achieved a great deal with Allison clearing up after her colleagues, Dan varnishing, timber being sourced for door surrounds and the revelation that a whole set of new axle box pads were need for the BSK. This will cost a further £600 that will have to be found before the coach enters service. 7 Wiring and protection continued to enable the 3 phase circular saw to enter service in connection with the Duffield platform extension and the PWT moved the timbers to be cut to site. The PWT also greased and fettled the handpoints within Wirksworth Yard. 8 Dmu renovation featured the renewal of the Bubble Car's guards van floor denying the guard a view of the ground below the vehicle. 9 The VCT turned their attention to the fencing and access requirements at Shottle that will complement all the hard work being put in by the walling team who mixed a great deal of concrete today. 10 We welcomed visitors from the Epping & Ongar Railway and the Keighley & Worth Valley Railway. 11 A pleasant enquiry from the Keith & Dufftown Railway yesterday resulted in a debate about their visiting steam engine last year for the first time in their history. It appears that the water supply for the locomotive came from the adjacent Glenfiddich Distillery - well!! A gentle day with the LMSCA Mark 1 men continuing to deal with the many problems of their BSK with today continuing further work on the guards doors. 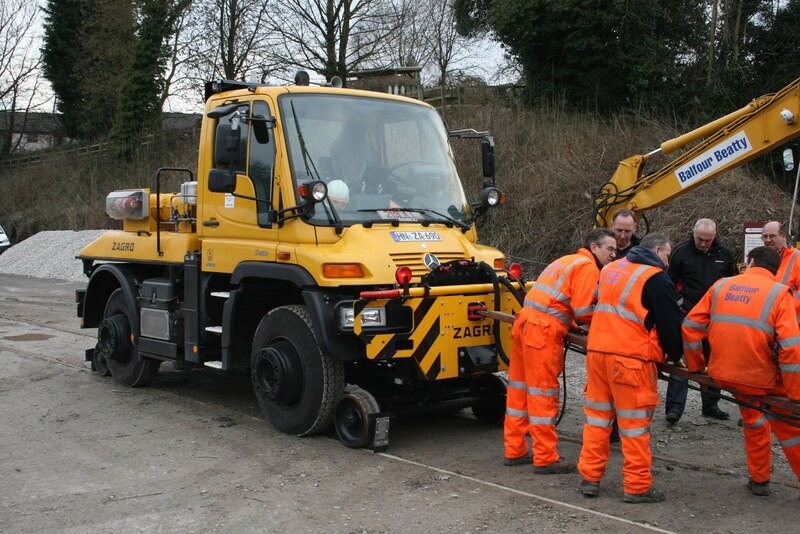 This small but perfectly formed team is transforming a vehicle with many problems back into something that will be a credit to our Railway. I was grateful to Hylton and Tony Watt who braved a Monday to trip two empty Lowmacs from Wirksworth to Shottle and return with three empty Dogfish for loading with white gold later in the week.This action was most helpful in the grand plan which make more sense next week. The Booking Hall and Pullman Buffet Car dealt with a few brave hearts that visited or called the Railway today. The DST are searching for more people to be involved in the preparation and disposal of the visiting steam engine in May. This is early morning and late evening work but does provide an opportunity to experience life from times gone by. 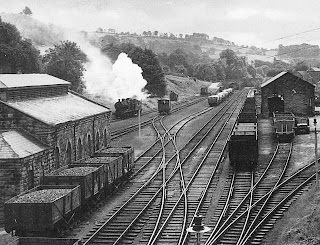 Please let me know if you are interested on wirksworth_station@wyvernrail.co.uk and I will let Bob Gibbens know so he can complete his planning of the three week event. 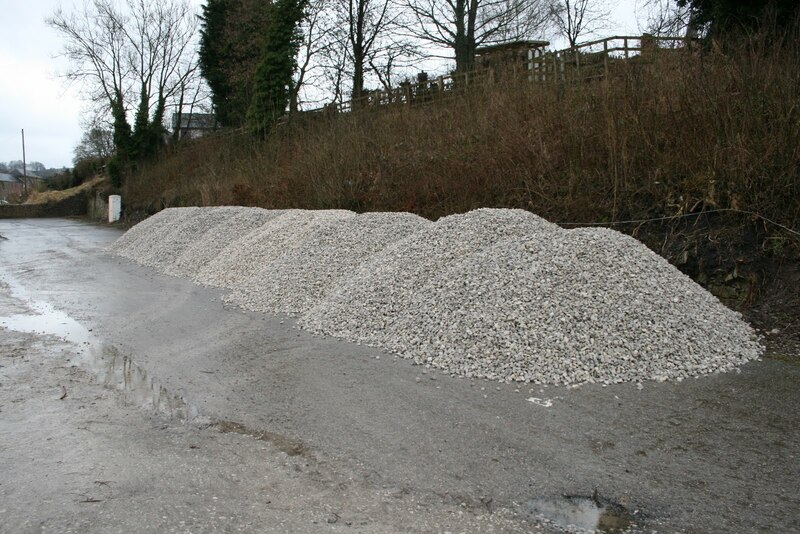 Quite a busy day with 130 tonnes of white gold being delivered to the Car Park for use in next week's testing and then be available for our use afterwards. Photo attached prior to each lump being numbered! Another milestone for two members of our fleet with the Bubble Car and Class 119 going out on test racking up some 65 miles of shakedown time. This is the first time the Class 119 has run more than a few feet for over 20 years reflecting great credit on the restoration team. Improvements to the former Dust Dock ramp fencing moved forward in the damp, cold conditions of today and the M1M made further progress in reconstructing the guards doors of the BSK. 33035 received some routine maintenance and checks ready for its first Drive a Diesel day of the year next Friday. The Booking Hall was in general admin mode and the Pullman Buffet Car had a modest trade enhanced by the Station Garage team feeling the need for extra large All Day Breakfasts. We have quite a lot of excitement next week which may be viewed from afar by the excellent webcams. PS - I sent fraternal greetings to the Chairman of the Bluebell Railway Preservation Society on behalf of our Railway in view of the opening of the extension from Kingscote to East Grinstead next weekend and received a warm response. Progress Thurs 14th March 2013. Another fine day had P way fettling Shottle south turnout including gauge adjustment and replacement of horrible corroded KT fastenings on the switch base plates. These fastenings are now obsolete and if anyone comes across any let us know as we have precious few left, preferably the later design with the longer bolt and curved single piece spring clip. Allsop corporation was hard at it again applying paint to the East side of coach SK. 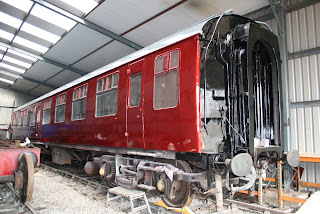 M1M/P was sorting out windows, finishing floor repairs and further preparation of the body for paint on coach CK. Rodney has been improving the gate way at Chapel Street Duffield. DMU gang had a tidy up of the bubble car and greased and oiled up the 119 unit ready for trials. Buffet and booking office open for business as usual. Progress Wed 13th March 2013. A brilliant day weather wise and a pleasure to be out with the works train delivering 29 crossing timbers to Duffield in readiness to relay the North turnout there and 60 dropped off at the side of the line in various places for spot resleepering. On the way back 2 wagon loads of logs were collected for resale but the planned retrieval of rail from Jebbs lane had to be postponed due to our friend Komatsu sulking yet again after many weeks of good behaviour. Platform builders managed 40 foot of course work. MIM/P group were in attendance on the CK. Allsop painting corporation applied primer to the east side of SK making use of the new solebar height walkway in the shed. Dream steam team were at work on Ellison with a secondment from LMSCA to apply the lining to the newly painted loco. Messers Newby continued with things electric in the weighbridge and the buffet and booking office were open for business as usual. > foundations for the platform there. > Bubble Car, where the guards van floor was addressed. > issues and mixed some very lumpy porridge on the shed table. > afternoon on the Trumpton Fire Engine. > on the tables of STD clinics. > Becoming a shareholder of WyvernRail has just become easier! Join ShareSave and invest in your railway for just 10 Pounds a month. > See www.e-v-r.com/ShareSave for details. painted some tanks with a very stiff brush. left-handed octopus, probably from Swindon. More wintery weather this Saturday ensured the Pullman Buffet's home made mushroom soup was a popular menu choice with our guests. We welcomed our first 'day with the driver' guest who had travelled from County Armagh, Northern Ireland and thoroughly enjoyed his day with us. Down the yard a number of volunteers had braved the cold to work on their respective projects. The LMSCA were busy preparing the 3rd open for varnishing, designing a brake gasket for the BSK, welding on the SK and attending to a vacuum cylinder problem on the CK. The 8F group were working on Cathrine's tubes and the DST were busy painting Henry Ellison and the commemorative plaques were attached to ensure they fitted before being removed in readiness for the locomotive's naming ceremony. The DMU restauration team attended to a number of tasks including fixing a vacuum leak in the class 119's DSD. Progress Thurs 7th March 2013. Evening all, p way was a bit thin on the ground today with just 3 of us to save the world. After receiving 29 crossing timbers and 60 sleepers it was off to Shottle to tidy up the ballast shoulder at the southern turnout with the afternoon spent completing the disposal of old crossing timbers at Shottle North ground frame. Allsop corporation completed gloss coat 2 on the SK. Eric and the dominoes along with Rob completed various shunting moves with Eric spending the rest of the day painting the bubble car bogies. DMU mob fitted the 119 unit with new brake shoes and their leader fancied a bit of wiper motor fitting on the bubble car. M1M/P gang continued with CK installing floors and making a start with the paint job preparation. Buffet was kept busy supplying yet more food to the DMU mob and the booking office was inundated with phone calls for bookings, charters etc. 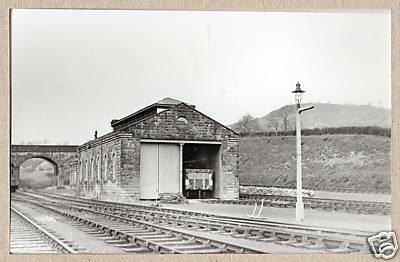 Messers Newby was kept busy sorting out electrical issues in the weigh bridge and we had a visit from a gentleman who will give us an idea of the cost for changing the visual aspect of Wirksworth station in a major way. Progress Wed 6th March 2013. Well, looks like we had summer yesterday with the temp today hovering around 2 degrees and freezing fog, but plenty going on around the railway. 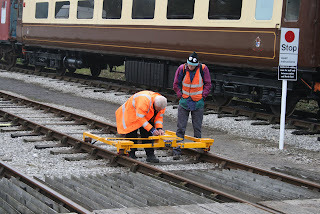 P Way carried out a full line inspection with the Wirksworth / Idridgehay section treated to an inspection with our track recording trolly revealing no defects requiring immediate attention. A broken rail on the shed sight was also attended to and various crossing ( frog ) bolts treated to some maintenance. Some of the rail on our site at Wirksworth is Midland 85lb yard in 20 foot lengths, no doubt starting life around the 1870s on the main line, then after 20 years or so relegated to the Wirksworth branch which after another perhaps 30 to 40 years relegated again to the yard where it has resided till the present day- no wonder it breaks now and again - owes nobody nothing. 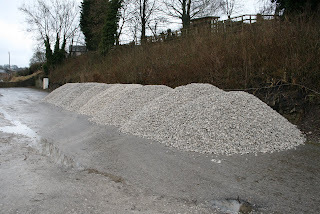 Rodney has again been hard at it at Duffield sorting out top soil from a pile of spoil for use in flower beds there. The lone carriage cleaner was again busy in the DMU fleet. M1M/P gang were at it with the CK floors which at one point resembled a Fred Flintstone version with no floor and lots of legs poking out underneath. Platform building gang have this week taken down the penultimate length of wall at Shottle- no mean feat with some of these blocks 2 to 3 foot square, 9 inches thick and weighing in at least 100kg. John Allsop painting corporation applied top coat to the west side door and window frames with black applied to the ends of coach SK. Due to the cold the paint was applied with a hammer and nails to ensure it stays on during the 3 month drying period. I wonder how British Gas shares are going on at the moment- still, it's a good job we have politicians with enough good sense to put in place an energy policy which forces us to buy gas from the Russians and not utilise any of the 3 billion tons of coal under our feet. A technical photo today as the high speed track recording train prepares to leave Wirksworth for Shottle taking advantage of the fact it is down hill all the way. I have a wonderful opportunity as a result of some last minute cancellations for a Drive a Diesel Day planned for Friday 22nd March. These retail at £199 but can be offered to readers of these missives at a one off, special price, of £99. The day will be hosted by our team of Lewis and Richard featuring L J Breeze in the morning and 33035 for a whole line experience in the afternoon. A brakevan accompanies the afternoon session where your partner or significant other can see how you perform. First come, first served. Just telephone Leigh on 01629 823076 between 1000 and 1600 tomorrow or next Tuesday, Wednesday and Thursday having your credit or debit card detail ready. These are quite memorable and satisfying days on our Railway. There are three places available as of now! It is said that the dmu team never cease their endeavours but they do spend quite some time eating! Stuck for a Mother's Day gift? 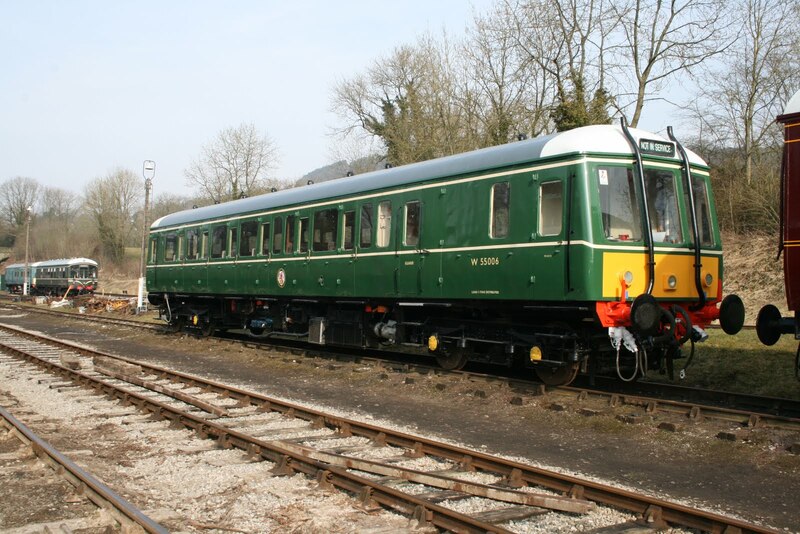 Travel the Ecclesbourne Valley Railway with a day rover ticket for all day travel and have a Sunday Lunch in the Pullman Buffet at Wirksworth Station. A free glass of sherry for Mum too! Pre-book only online at our Online Ticket Office. A photo of the newly painted "Bubble Car" basking in the sun. Anothe Allsop masterpiece! Peace reigned after the splendid results of the weekend which heralded a most satisfactory start to the new season. Many thanks to all involved as we still seem loved by our passengers! At base today was a steady stream of visitors to the Pullman Buffet Car in the Spring-like sunshire and the steady ring of the telephone with new possibilities. The LMSCA were taking advantage of the peace and quiet to make further inroads to the restoration of their BTO and renovation of the BR Mark 1 BSK in time for the May excitements. A photo is shown of the BR Mark 1 SK gleaming in the Maintenance Facility as we hurry towards producing a suitable set of coaches for our visiting steam locomotives this year. to all concerned for a smooth running event. on the cab desk and its associated electrics. vehicles being restored or repaired in the shed. It was a delight to welcome our first Steam Experience customers of 2013 and the product seems quite popular this year with most Fridays booked well into the summer. My thanks go to the DST and John Evans who made this a day to remember for our clients. We also used today to trial the 4 coach formation that mimics the stock that will feature on our mainline steam days and iron out various issues such as stopping points and how we might manage the run round at Duffield. This was a most useful exercise and, again, I thank all involved for their contribution. During the journey opportunity was taken for the Board of WyvernRail plc to have their monthly meeting. The handrails up the slope to the former dust dock were enhanced by extra wood strips to ensure our visitors do not plummet onto the Model Railway container and the Pullman Buffet Car was quite busy with our experience customers and their friends. We now have all to play for with the season commencing this weekend. The winter has been long and short of income and I look forward to a period of earning more than we spend!